A portion of proceeds made tomorrow at the shops and restaurants below will benefit Haiti and the American Red Cross. Head out tomorrow if you can and help Decatur raise some money! Hope to see you around town tomorrow! Damn you coca-cola. 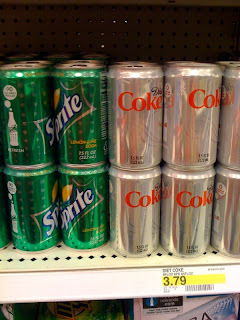 I try not to drink any sodas, but of course you had to come out with a super cute 7.5 ounce can to tempt me. Being in the retail world the past two years has really increased my susceptibility to cute packaging. Luckily I had too much stuff in my hands at Target, otherwise you would have come home with me. Anybody else a sucker for packaging? Send your friends some online love with these cute e-cards from ecojot. I just sent one to a friend and I hope she enjoys it! 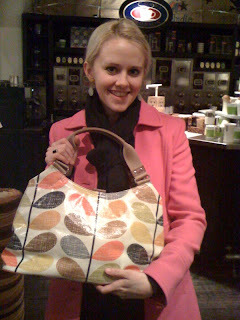 Orla Kiely is known for her graphic patterns and the thing I love most about this bag is that it's her signature stem print, but each leaf is "scribbled". It tones down the big stem print and softens the whole look of the bag. As part of his effort to keep the forest a family place, Mayor Brownbear announced a plan to clean up the notorious Nutpacking District, a stretch of hollow trees known for its "exotic squirrel" clubs. Under the mayor's proposal, clubs that allow heavy petting would hereby be prohibited from selling birdseed. And all clubs would have to close by the time the owls come out. "It's outrageous," said club promoter Jimmy Acorn, who owns both The Bushy Tail and Woodchuck's. 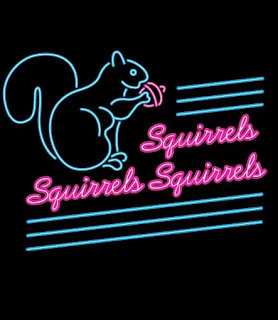 "The real losers in this are the flying squirrels, who are nocturnal. Now where are they supposed to go to see a little fur?" But the mayor can count on support from the conservative group Focus on the Forest, which helped pass a previous law defining marriage as between one deer and one doe. You can find this t-shirt and more at Headline Shirts. Mmmm...nothing like a nice big helping of fried okra from Zesto's to make the tiredness from the day go away. Crispy and salty...just the way I like them.